Purple is a very regal and majestic colour that can brighten up your decor and make a wonderful statement in your home. It’s no wonder that it used to be the colour of royalties which was used liberally by them back in those days. 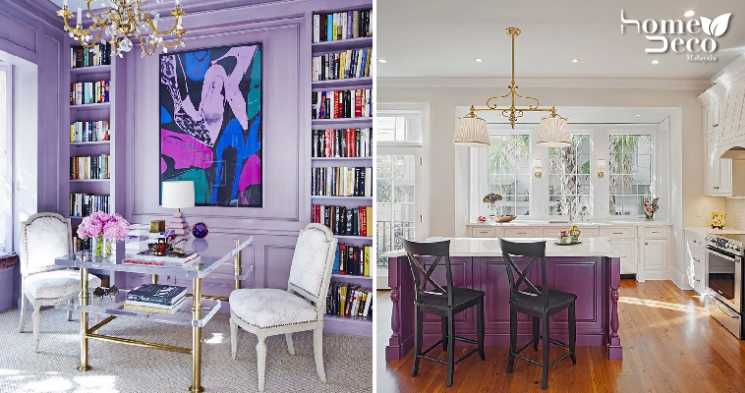 Now, you can also dress up your home just like a noble with these cool purple ideas. Put an eye-catching item in your living room like this cute purple sofa and to make it even more outstanding, put a pair of them for extra comfy seating. The rest of the decor is done in neutral tones so that the sofas can take all the attention, as they should. There are many shades of purple and this hue that is used in the dining room is perfect especially when it’s paired with silver. The colour is not too loud and together with the silver and cream decor, it makes the whole dining room look really elegant. If you have a plain white kitchen then spice it up a little by installing some purple kitchen cabinets in your home. To make it look even more of a focal point, use a glossy finish that will make it look more trendy. Go all out by using some soft purple hues on the walls to make the entire room look really fabulous. Add an abstract art painting with some complementary shades for a more seamless look that is also paired with neutral colours. Another great way to add some regal purple into your kitchen is to use it for your kitchen island which will instantly make it look so chic. It also creates a more modern feel in your kitchen but do make sure to keep the rest of the decor simple and clean for the island to make an impact. If you want an easy way to incorporate purple in your home, using a textured or patterned wallpaper will work really well especially if you don’t want to change much of your existing decor. You can place other purple decor items in the room as well to match the wallpaper.